Whether or not to feed a bird grit is a controversial question among wild bird owners. While some feel as though it's unnecessary, others say that it provides birds with important nutrients they normally get in the wild. 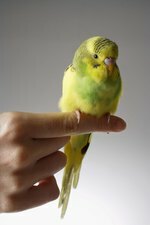 If you choose to feed your birds grit, there's no need to spend a lot of money on expensive products at pet stores. Crushed eggshells make a great grit for your birds that only takes a few minutes to prepare. Collect eggshells. You can make this in smaller batches, but it's easier to collect the shells from 10 or more eggs and create a larger batch. Chicken eggshells work just fine. Rinse out the eggshells. Make sure there is no egg left in the shell and then lightly dry it with a paper towel. Place the shells in a microwave-safe bowl. If you're making a very large batch, you might want to place half the shells in the bowl and do another batch later. Microwave the shells on high for 30 seconds at a time. After each time you microwave, check to see if the egg shells have dried out. When they're done they will be dry and easy to crumble. Microwave times will vary based on oven temperature, but this should only take two to three minutes per batch. Crumble the shells. Make sure the pieces are as tiny as possible so your birds can easily digest them.